New collectors to the Liberty Seated dime series often ask, "what is the variety of my recently purchased Seated dime?". Using the Seated Dime web-book at www.seateddimevarieties.com is straightforward if the collector has an understanding of the basic variety attribution process. The information at this link is designed to get new collectors up and running with variety attributions in a short period of time. 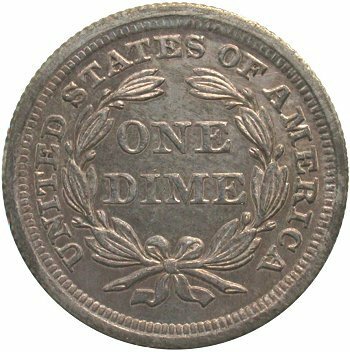 - Each Seated dime extant was struck with an obverse and reverse die. These dies were in a certain die state. By using the web-book, a collector or major auction house should quickly learn the variety of the dime under study. - Obverse dies are named 1, 2, 3, 4 etc. while Reverse dies are named A, B, C, D, etc. 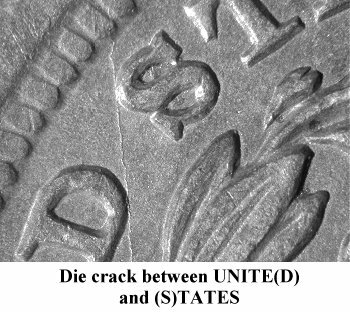 - Die states for Obverse dies are listed as 1, 1.2, 1,3 etc. while Reverse dies are listed as A, A.2, A.3 etc. - A combination of Obverse and Reverse die names form the web-book variety number listed as 101, 102, 103 etc. - Die states for a web-book variety are listed as 101a, 101b, 101c etc. 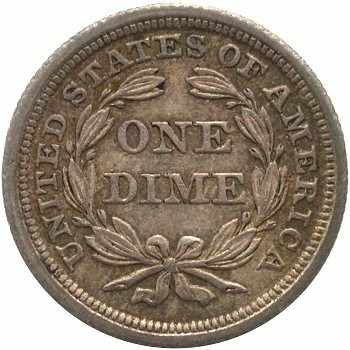 How to Attribute a Seated Dime Variety? The Method Gerry Fortin Uses Every Day! 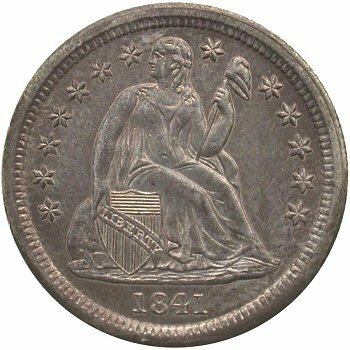 Step 1: Go to the Seated Dime Guide & Rarity Rating link and select the date and mintmark to be attributed. 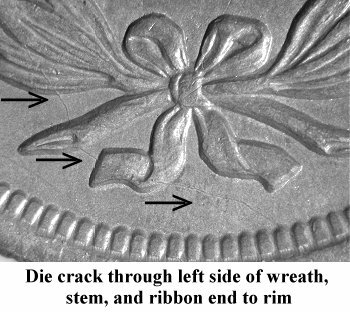 You should carefully study the information on Denticle Ruler on this page and learn how to measure the date placement if this is your first time attributing a Seated dime. - Have a good loupe or magnifying glass ready for the task! 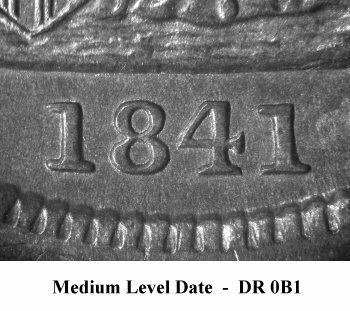 Step 2: Once you have selected a date and mintmark page, measure the date placement on dime being attributed. Finding the "0" denticle is key. Step 3: Match your date placement measurement with the matrix at the top of each date page. For example, the 1841 matrix is copied and illustrated here. 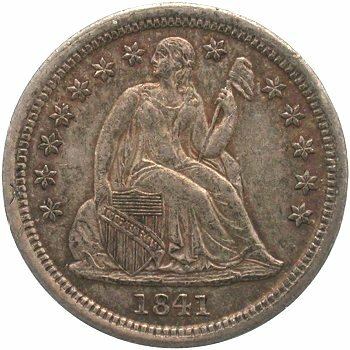 Note there are 10 varieties defined for the 1841 date (101 through 110) and 2 die states (107a and 110a). The Denticle Ruler is shown as -1B0 through 2R. The blue highlighted measurement points (-1B0, 0B1 and 1B2) are the spaces between denticles. Step 4: If the date placement on your dime is say, 0B1, then scroll down to the F-102 and F-106 images. Shown below are the two varieties as an example! - Note that F-102 has a repunched 1 on the date and die cracks on the reverse while F-106 has only a medium level date as a diagnostic point. Step 5: If you are not sure if the dime being attributed is F-102 or F-106 based on these images and brief highlights, then click on the images to access the complete web-book variety webpage for much more detailed information. Step 5 Repeated! Again note that F-102 has a repunched 1 on the date and die cracks on the reverse while F-106 has only a medium level date as a diagnostic point. If you are not sure if the dime being attributed is F-102 or F-106 based on these images and brief highlights, then click on the images to access the complete web-book variety webpage for much more detailed information. If you mouse click or touch screen the F-102 images, then this information is accessed. Shown immediately below is the webpage for the 1841 F-102 variety. If Not a Variety Match, Backup and Try Again! 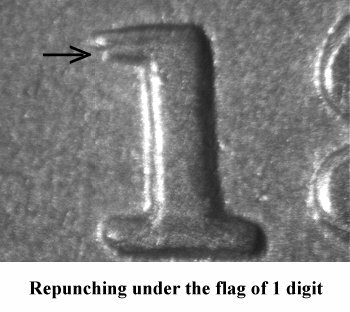 Step 6: If you were not successful in matching the dime being attributed with the 1841 F-102 information, then you are entering a process of elimination based on Denticle Ruler position. You will need to study the DR 0B1 F-106 variety and other varieties that have a date placement to the left or right of DR 0B1. You will need to check the variety pages for Denticle Ruler measurement IL (F-103) or Denticle Ruler measurement 0R (F-107, F-108 and F-109) until the right variety information matches the observation from your dime! This activity will take some time so have patience and enjoy the process!